Bike Confidence encompasses bike safety (confidence) rules of the road, basic maintenance, bikes vs cars, bikes vs pedestrians, training courses run by LCI certified trainers, meetings, panels and conferences. Learn the ABC's of Bicycles that include checking your bike's Tires (Air), Brakes, and basic bike maintenance. 2. Finding the right Bike for you? Which bike works for you? We will discuss the various types of bikes, budget and sizing. Find a bike that fits your needs and style! Helmets, Lights and Reflectors, OH MY! Learn the importance of what to wear when you are riding. Learn to be a savvy, safe rider as we discuss hand signals, signage, bike/pedestrian paths and review Mass bike laws and more! New to biking? We will give you that "Bike Confidence" by learning to ride in a safe, controlled environment. Are you a biker but nervous about biking on the road? Or want to learn maneuvers? We will start with an obstacle course then take a ride together on a bike path and street as a group to begin to become familiar with riding on the roads. 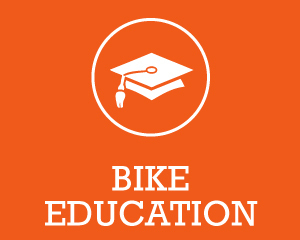 Why is Bike Education Important? Biking is an excellent way of exercise, fun and a mode of transportation. No matter the reason that you bike, it's important to know how to operate a bicycle and why sharing the road successfully is key. Understanding traffic laws, traffic patterns, cyclists, driver and pedestrian behavior, bicycle maintenance and awareness of surroundings play a role in crash avoidance. Children need to understand the basics of bicycle safety as well. We offer our younger riders, all of the tecniques, without the streets.